Parishioners are devastated after a fire destroyed their 150-year-old church in Wakefield, Massachusetts. While a historic Massachusetts church was destroyed in a fire this week, one religious artifact inside was left completely intact. A Boston Globe photographer captured a building inspector carrying a painting of Jesus from the First Baptist Church on Tuesday night. 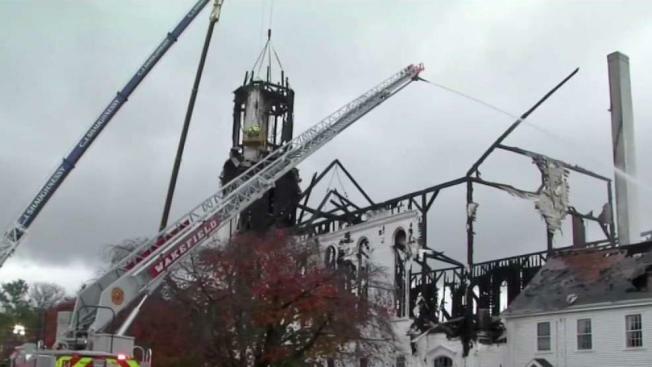 The painting, which depicts Jesus standing in a white robe with his crucified hands extended, was left unscathed after flames engulfed the Wakefield church. A former parishioner told the paper that the painting will be given to a former pastor from the church on Lafayette Street. Officials believe a lightning strike during a severe storm ignited the fire at the 150-year-old church. The blaze ultimately reached seven alarms. "We've had near misses with lightning before. Unfortunately, it just did a really good job this time," Wakefield Fire Chief Michael Sullivan said. The structure was home to both a congregation and a day care. Interim Pastor Norman Bendroth said the community has not yet discussed what will come next. "My heart breaks for the folks who have been here for generations," he said. On Wednesday, heartbroken parishioners and area residents watched while crews dissembled the steeple. "This has always been a second home for me," parishioner Emily Brown said. "All I picture is all the rooms and all the hallways and the sanctuary." In a statement on the church's website, church officials thanked the firefighters and community members for their efforts and support. "We know that we serve a God who specializes in restoring brokenness and who can bring beauty even from ashes," officials wrote. "So we move into the future with trust, hope, and gratitude." Three firefighters suffered non-life threatening injuries battling the blaze and were treated on scene. Parishioners met Wednesday night to discuss immediate plans for the congregation. They were hoping to hold a service either in front of the church or at another church as early as the weekend.